After Work. Monday: home-shopping in John Lewis and checking out the Christmas lights in Regent Street, Oxford, Soho, Covent Garden and Mayfair with Sanoop. Tuesday: Coal Drop Yards – there’s always something new and shiny to admire in London, in this case, steel wings and luminous tubes kissing atop Victorian warehouses serving as home to chic boutiques and eateries! Wednesday: Watching When Harry Met Sally in bed. Friday: Mulled wine in cosy Maltby Street Market. Weekend. On Saturday, we head over to the Hippo for coffee and then take the train into Sloane Square for breakfast at a swanky cafe. 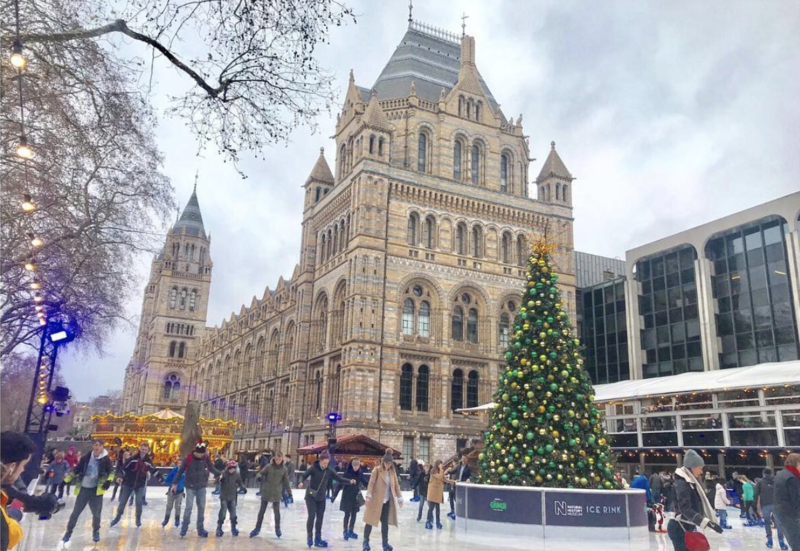 We walk over to check out Saatchi afterwards, and then through Chelsea to South Ken to watch the ice-skaters at the Natural History Museum. Lunch in the beautiful cafe at the V & A. Christmas shopping in Harrods. Meet an old friend and walking back through Chelsea with her – for a takeout dinner at her place in Fulham. On Sunday, we go to Kew Gardens, where tears start streaming uncontrollably from my eyes as we step into a tropical greenhouse. I just stand there between the palms and ferns and cry and cry and cry and cry. It occurs to me that I never ‘got to’ cry over leaving Singapore; we left for something good, and we left together. There was nothing to cry over, really, just lots to be excited and feel grateful for. But there is a little girl inside me who still needed/needs to dwell a little bit on the sentimental notion of leaving something good behind (even if it’s for something else that’s good as well). Sanoop comforts me with a hug and a promise that we always can come back here whenever we miss Singapore. I don’t think I’ll be needing that. I think this is all I needed – just a short and sweet cleansing weep. From there, we head up north for some mulled wine at a friend’s place, and at night, we have a cosy roast dinner at No 1a Duke Street, a very swanky and cosy gastro pub in Richmond.